In 2011, average collective agreed weekly working time in the European Union stood at 38.1 hours. The working week was on average 30 minutes shorter in the pre-2004 EU15 countries and over 1 hour and 30 minutes longer in the new Member States. Agreed normal annual working time averages nearly 1,720 hours in the European Union as a whole – 1,686 hours in the EU15 and over 1,830 hours in the new Member States. Of the three sectors examined, retail recorded the longest average agreed normal weekly working hours with 38.3 hours, followed by the chemicals sector with 37.9 hours and the civil service with 37.6 hours. The average collectively agreed paid annual leave entitlement stood at 25.3 days across the EU, being slightly higher in the EU15 countries (26.7 days) and considerably lower in the new Member States (20.8 days). Figures for normal weekly working hours are also problematic when comparing working time between countries, as these do not take into account factors such as overtime, the length of annual and other forms of leave, or the use of flexible forms of working time organisation. This report follows the previous edition in the method it uses for calculating averages for the groups of EU Member States (EU27, EU15 and NMS12). The average figures provided for these country groupings are weighted in order to reflect the relative country sizes in terms of persons aged 15 to 64 who are employed full time, according to the Eurostat’s Labour Force Survey (LFS). 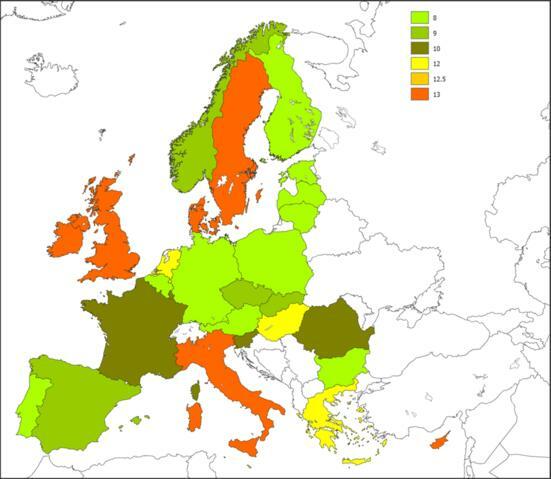 Collective bargaining plays an important role in determining the duration of working time in most of the EU27 countries, though to a lesser or sometimes negligible extent in some of the Member States that joined the EU in 2004 and 2007 (hereafter referred to as the new Member States or NMS). The nature and extent of this role also differs widely between countries, with bargaining at different levels (intersectoral, sectoral, company, etc.) playing different roles, and bargaining coverage varying considerably (in general, being higher in the EU15 than in the NMS). Moreover, the importance of bargaining may also differ greatly among sectors of economic activity and groups of workers. The relationship between bargaining and legislative provisions on working time continues to vary between countries. Figure 1 depicts the average collectively agreed normal weekly hours in the countries where those data exist. In some cases, such as Estonia, Latvia, Lithuania, Luxembourg, Poland and Slovenia, working time is not generally defined through collective bargaining. In the cases of Hungary and Malta, most collective agreements replicate the statutory maximum working week of 40 hours whereas in Bulgaria, although collective bargaining covers working time in parts of the economy, there are no data available for any estimation. For the majority of countries it is, however, possible to present average agreed hours in 2011. With the very few exceptions mentioned below, there were no changes in comparison with 2010 (TN1106010S). The only reported changes took place in Slovakia and Spain. Whereas the former country was the only one registering a fall, of 0.1 hours between 2009 and 2010, the latter continues in an upward trend: 0.2 hours more in 2010 and 0.1 hours in 2011. France remains the country with the shortest average collectively agreed working week, of 35.6 hours. This most likely reflects the effects of the Aubry law establishing a statutory working week of 35 hours since 2000 (FR0001137F). The Nordic countries, together with the UK and the Netherlands, continued to register an average agreed normal working week below the EU15 average of 37.6 hours in 2011. Note: the data should be interpreted in conjunction with the notes in Annex 1; EU27, EU15 and NMS figures are the author’s own calculations of weighted averages based on relative country sizes in terms of employment (Eurostat, LFS, 2011). The following sections look at the average normal weekly working hours for full-time workers as set by collective bargaining in three sectors selected to represent the manufacturing industry, services and the public sector – chemicals, retail and the civil service. While the more specific sectoral figures below are probably more accurate than the overall average data given in the previous section, caution is again advised in their interpretation and use. The notes to each figure must be taken into account to for correct interpretations; all the caveats noted in the previous section also apply to the sectoral data. The retail sector recorded the longest average agreed normal weekly working hours with 38.3 hours, followed by the chemicals sector with 37.9 hours and the civil service with 37.6 hours. The agreed weekly working hours are higher in the NMS than in the EU15 in all three sectors. The largest gap can be found in the civil service sector, in which the normal agreed working week in the NMS is three hours longer than in the EU15. The gap is 2.1 hours in the chemical and retail sectors. In most of the NMS there is a uniform 40-hour working week, which corresponds in general to the statutory normal week in those countries; this is the case in Bulgaria, Estonia, Hungary, Latvia, Lithuania, Malta, Poland, Romania and Slovenia. Other countries also have uniform agreed weekly working hours across the three sectors, though these are shorter (39 hours in Ireland, 37.5 hours in Norway, 37 hours in Denmark and 35 in France). Relatively little variation exists in Austria, Belgium, Cyprus, Germany, the Netherlands, Slovakia and the UK, countries in which none of the three sectors examined differ by more than two hours. Wider sectoral differences exist in the Czech Republic, Finland, Italy, Portugal, Spain and Sweden. Figure 2 shows collectively agreed normal weekly hours in the chemicals industry in 2011, according to the relevant sectoral collective agreements, except where specified in the notes relating to the figure (see Annex 2). There were no changes registered between 2010 and 2011. Moreover, there was virtually no change in relation to the 2009 levels in most countries, with the exception of a rise of 0.3 hours in the Netherlands and declines of 0.3 hours in Italy and 0.1 hours in Slovakia. There were also registered changes in Greece (a rise of one hour) and in Sweden (a decrease of one hour) between 2009 and 2010, which are due to the use of different sources. Note: the data should be interpreted in conjunction with the notes in Annex 2; EU27, EU15 and NMS figures are the author’s own calculations of weighted averages based on relative country sizes in terms of employment (Eurostat, LFS, 2011). Across the EU27, the average agreed working week in the chemicals sector stood at 37.9 hours, almost 25 minutes more per week than the average for the EU15 but clearly lower than the average for the most recent members of the European Union, which stood at 39.6 hours in 2011. Within the EU15, the longest weekly hours in chemicals in 2011 were found in Greece, Luxembourg and Portugal (40 hours) and the shortest in France (35 hours) and Denmark (37 hours). Working hours in chemicals are markedly higher than the national whole-economy average in Sweden, Finland, Portugal and the Netherlands – respectively 1.8, 1.3, 1.1 and 0.9 hours more. And they are notably lower in Slovakia, Austria and France (1.5, 0.8 and 0.6 hours less) but also in Italy and the Czech Republic (30 minutes less). Overall, the average agreed working week in chemicals stood slightly below (-0.1 hour) the whole-economy average for this group of countries. In the NMS, average weekly hours in chemicals stood at 39.6 in 2011, exactly the same as in 2010. Within this group of countries it is important to note the cases of Bulgaria, Latvia and Lithuania, in which working time in the sector is not regulated by collective agreements. Cyprus, the Czech Republic and Slovakia continue to be the countries in this group with an average agreed weekly working time below the EU15 average, while the other NMS stand at 40 hours or 2 hours and 30 minutes higher. In Slovakia and the Czech Republic, weekly hours in chemicals are below the whole-economy national average by, respectively, 1.5 and 0.5 hours. 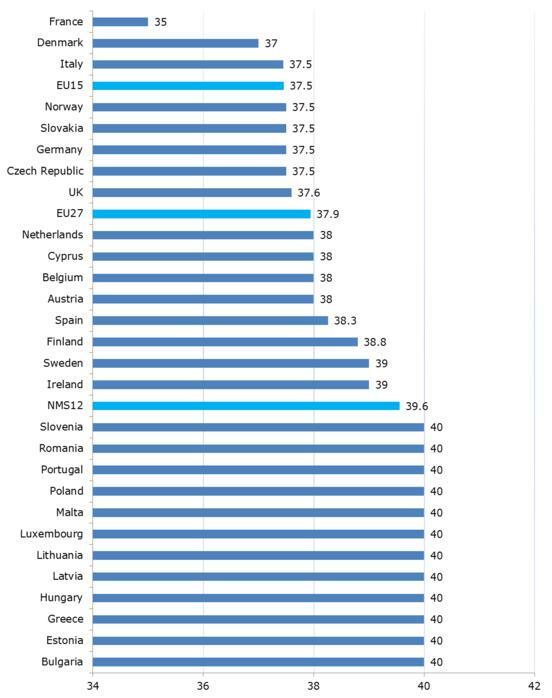 According to the most relevant available information on sectoral collective agreements, in 2011 the collectively agreed normal working week in the retail sector stood at 38.3 hours in the EU27 (Figure 3). Although there was no change in relation to 2010, this represents a decrease of 0.7 hours, or around 42 minutes per week, in relation to 2009. Changes between 2010 and 2011 were only registered in the Czech Republic (-0.3 hours per week), Sweden (-0.1 hours per week) and the UK, where average weekly working time in retail increased by 0.2 hours per week. In the EU as a whole, the average agreed weekly working time in retail was 0.2 hours higher than the overall whole-economy average. Note: the data should be interpreted in conjunction with the notes in Annex 3; EU27, EU15 and NMS figures are the author’s own calculations of weighted averages based on relative country sizes in terms of employment (Eurostat, LFS, 2011). In the EU15, average weekly hours in retail stood at 37.8 in 2011, the same level as 2010 but 0.2 hours lower than the figure for 2009. The longest weekly hours in retail were found in Greece, Italy, Luxembourg and Portugal (40 hours per week), and the shortest in France (35 hours), Sweden (36.3 hours) and Belgium (36.7 hours). Working hours in retail are markedly higher than the national whole-economy average in Italy, Portugal, the Netherlands, the UK and Spain, and lower in Belgium, Sweden, Germany and Austria. Overall, the average agreed working week in retail is 0.3 hours above the whole-economy average for the country group. In the NMS, average weekly hours in retail stood at 39.9 in 2011, registering no change since 2009. The 2011 retail average for the NMS was 1.6 hours above the EU15 average for the sector and 0.2 hours above the whole-economy average for this group of countries. Average weekly hours stand at 40 (that is, 2.2 hours higher than the EU15 average) in all the NMS except Cyprus, the Czech Republic and Slovakia, with average weekly hours in the sector below that level In Cyprus, the figure is below the average figure for the EU27. In Slovakia, weekly hours in retail are above the whole-economy national average. In the civil service sector, legislation, rather than bargaining, plays an important part in setting weekly hours in many countries. There was virtually no change from 2010 in the ‘collectively agreed’ normal weekly hours in the sector in all countries. 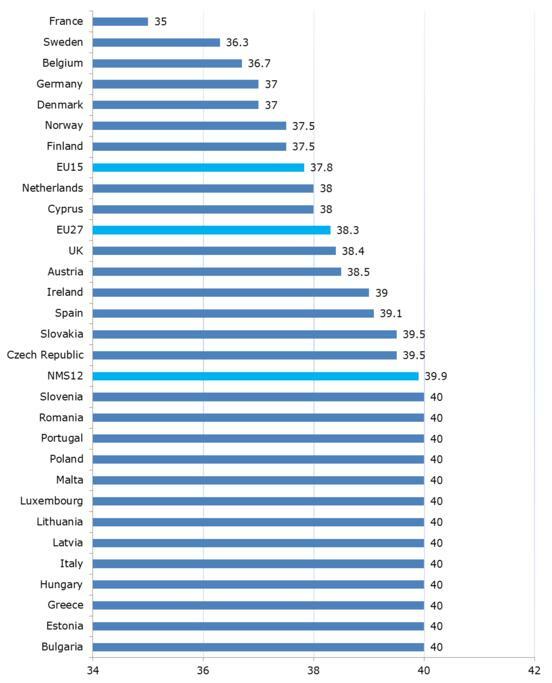 The exception was Slovakia, where according to figures based on multi-employer collective agreements concluded for the civil service, the normal working week increased from 37.5 hours in 2009, to 37.7 in 2010 and 37.8 hours in 2011 (Figure 4). Across the EU27, the average agreed weekly working time in the civil service was 37.6 hours in 2011, about 30 minutes less than the overall whole-economy average. In 2009 and 2010, the average in the sector stood at 37.5 hours but the difference in relation to 2011 is not substantial as it is mainly due to the rounding of figures: the actual change is only 0.02 hours, which is little more than 1 minute more per week, resulting from the mentioned increase registered in Slovakia. Note: the data should be interpreted in conjunction with the notes in Annex 4; EU27, EU15 and NMS figures are the author’s own calculations of weighted averages based on relative country sizes in terms of employment (Eurostat, LFS, 2011). In the EU15, average weekly hours in the civil service stood at 36.9 in 2011 – the same as in 2010 and just slightly higher than the 36.7 hours registered in 2009. In 2011, the longest weekly hours in the civil service were found in Austria, Greece and Luxembourg (40 hours per week), and the shortest in France, Portugal and Spain (35 hours per week). Working hours in the civil service are markedly higher than the national whole-economy average in Germany, Austria and Sweden, and notably lower in Portugal, Spain, Italy, Finland, the Netherlands, France and the UK. Overall, the average agreed working week in the civil service was 0.7 hours below the whole-economy average. In the NMS, average weekly hours in the civil service stood at 39.9 hours in 2011, three hours more than the EU15 average. Average weekly hours stand at 40 in all the NMS except Cyprus and Slovakia, where the figures are closer to the average for the EU27. In these two countries, weekly hours in the civil service are below the whole-economy national average, while in the other countries they are the same as the whole-economy average. The Czech Republic is the only exception, where weekly hours in the sector are two hours above the national average collectively agreed normal weekly working time. Overall, the average agreed working hours in the civil service in the most recent Member States are just 0.2 hours below the whole-economy average. A significant change took place in Spain in January 2012, when the average working week lengthened from 35 to 37.5 hours through the implementation of Royal decree 20/2011 of 30 December on urgent measures for the public deficit reduction. 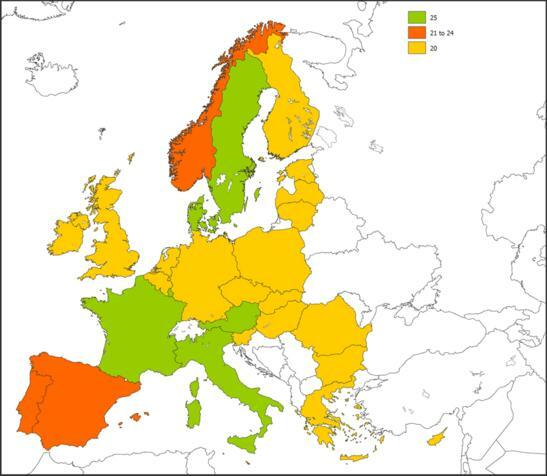 As Figure 5 shows, the countries can be divided in two main groups: those that set their maximum weekly hours at the 48 hours specified in the Working Time Directive, and those that operate a lower limit of 40 hours. There is also a small group of countries that constitute exceptions as described further below. In the first, smaller group of seven countries (shown in gold in Figure 5), the statutory 48-hour maximum is in excess of average collectively agreed weekly working hours (see Figure 1), and of average actual weekly hours (see Figure 7), and appears to operate essentially as a safety net. It should be noted that the 48-hour figure in these cases includes overtime. As permitted by the Working Time Directive, a number of countries allow for individual workers (generally or only in specified sectors) to ‘opt out’ of the 48-hour weekly maximum (this is the case, for instance, in Malta and the UK). In the second group of 18 countries (shown in green in Figure 5), the statutory maximum for a normal week of work is much closer to average agreed or actual weekly hours and is identical to agreed hours in some cases, indicating a more active role for the law in governing working time. However, overtime is not included in this figure, and the ‘maximum’ may function in practice as a statutory normal working week. Such statutory working weeks exist in some countries with a 48-hour maximum, such as Bulgaria, Cyprus, the Czech Republic, Estonia, Greece, Italy, Lithuania, Luxembourg, Norway, Poland, Slovenia and Sweden. The limits referred to may be exceeded in many countries where working time flexibility schemes allow weekly hours to be varied around an average over a reference period, as permitted by the Working Time Directive. Weekly maximum working time under such hours-averaging schemes may itself be subject to a ceiling, such as 60 hours. In the Netherlands, for example, weekly working time – including overtime – may not exceed 48 hours on average over a 16-week reference period, or 55 hours per week on average over a four-week reference period, unless otherwise agreed by the employer and trade union or works council, subject to an absolute weekly limit of 60 hours. Similarly, in Portugal, the weekly limit of 40 hours may be periodically extended to 60 hours although it must not exceed a bimonthly average of 50 hours and an annual average of 40 hours. 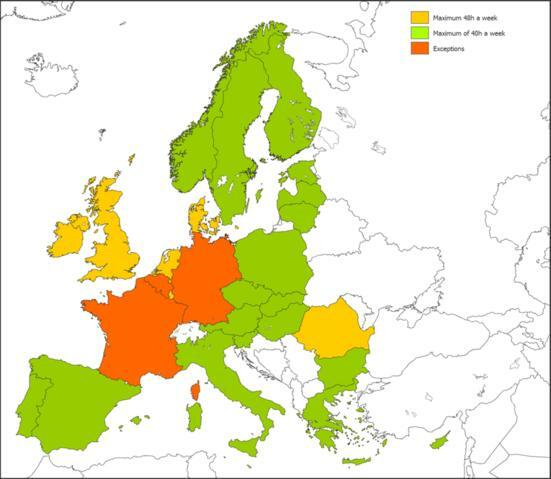 The complexity of the European picture relating to weekly working time, overtime and variable working time is perhaps best illustrated by the exceptions of Belgium, France and Germany (shown in orange in Figure 5). Whereas in France the working week can extend from 35 hours up to a maximum of 48 hours (including overtime), in Belgium the rule is 38 hours as the lower limit but with the particularity that work carried out in excess of 40 hours is considered as overtime and the absolute maximum is 50 hours per week. In the German case, the statutory maximum is set for a working day rather than a week. The statutory maximum working day in all countries did not change compared with the previous year. All the countries examined also have a form of statutory maximum working day, as set out in Figure 6.
the remaining 10 countries stipulate 8 hours. In the Czech Republic, daily hours may be extended from 9 to 12 under working time flexibility schemes, within a defined reference period. In order to obtain a more accurate picture of how many hours workers really work in a given week, it is necessary to turn to statistics on actual weekly hours worked. These are typically measured in labour force surveys, which include factors such as overtime and absence. Figure 7 provides harmonised Eurostat Labour Force Survey (LFS) data on the ‘average number of actual weekly hours of work in the main job’ of full-time employees in 2011. These hours include all hours, including extra hours, whether paid or not. Notes: According to Eurostat, the ‘actual hours worked’ in the reference week are the hours the person spent in work activities during that week. Work activities should include production activities, ancillary activities, short breaks and education and training necessary for successfully carrying out the job tasks. Actual hours worked exclude travel time between home and the place of work, main meal breaks, absences from work within the working period for personal reasons, and education and training hours not necessary for carrying out the job tasks. In the EU, full-time employees in Romania worked the longest actual weekly hours in their main jobs in 2011 – 41.3 hours, the same as in 2010. They were followed by employees in Luxembourg (40.7), Germany (40.6), Estonia and the UK (both 40.5), Austria and Bulgaria (both 40.3), and the Czech Republic and Poland (both 40.2). Employees in Finland worked the shortest hours (37.8). This was 3.5 hours less than their counterparts in Romania or 4.5 weeks of work in Romania in a full year. 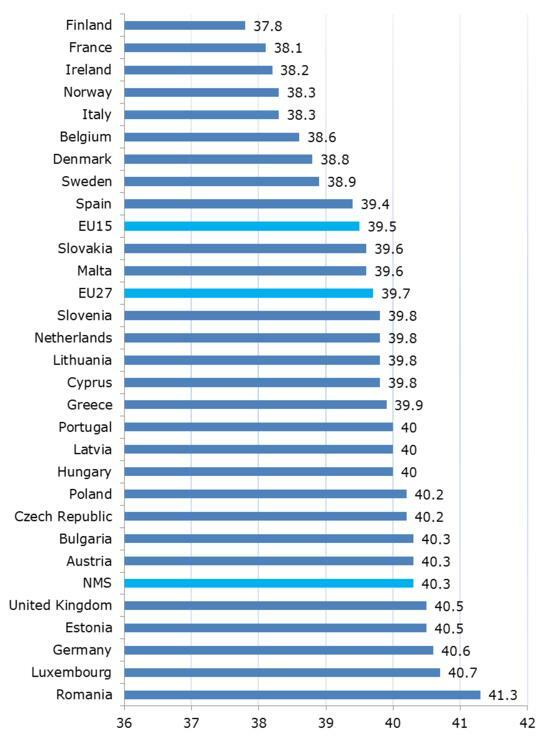 Ten of the 12 NMS had actual weekly working hours at or above the EU27 average of 39.7 hours, compared with only seven of the EU15 nations. Of the NMS, only Slovakia and Malta had an actual working week that was slightly shorter than the EU27 average (39.6 hours). In the EU15, the longest actual full-time hours were worked in Luxembourg (40.7), Germany (40.6) and the UK (40.5), and the shortest in Finland (37.8), France (38.1) and Ireland (38.2). In the EU27, the actual working week was 39.7 hours in 2011, the same as in 2010; this was 1.6 hours more than the agreed working hours. In the EU15, the working week was 39.5 hours, 1.9 hours more than the agreed hours. In the NMS, the working week was 40.3 hours, 0.6 hours longer than the agreed working hours. 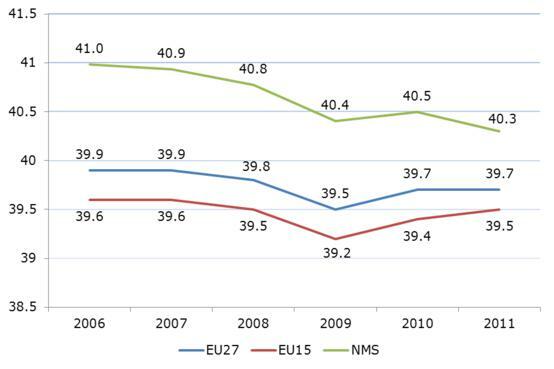 The annual figures for actual weekly working hours in the EU from 2006 to 2011 indicate that whereas the EU15 continued with the upward trend following the reversal registered in 2010, the NMS registered the opposite and in 2011 got closer to the European average (Figure 8). In the EU15, the actual working week was 0.1 hours longer than in 2010, while in the NMS it was 0.2 hours shorter. However, the variation between 2010 and 2011 is diverse between Member States. It is possible to distinguish three groups of countries. In Bulgaria, the Czech Republic, Hungary, Italy, Luxembourg, Malta, Poland, Slovenia and Sweden, actual working hours decreased in 2011 (by between 0.1 and 0.4 hours). Austria, Belgium, Finland, Latvia, Romania, Spain and the UK did not register any changes. In Cyprus, Denmark, Estonia, France, Germany, Greece, Ireland, Lithuania, Slovakia and Norway, only very modest increases of between 0.1 and 0.2 hours were recorded. The Netherlands and Portugal registered the most significant changes in 2011: full-time employees actually worked on average 0.3 and 0.5 hours more per week respectively than they did in 2010. Along with this general upward trend, the gap between agreed and actual hours widened again in 2011 within the EU15 countries but narrowed for the NMS. In the European Union as a whole, the difference between actual and agreed weekly hours remained at 1.6 hours, which means that on average workers actually worked one hour and 35 minutes more per week than the average agreed weekly hours. In 2011, actual weekly hours worked by male full-time employees in their main jobs continued to exceed those of their female counterparts in all Member States. 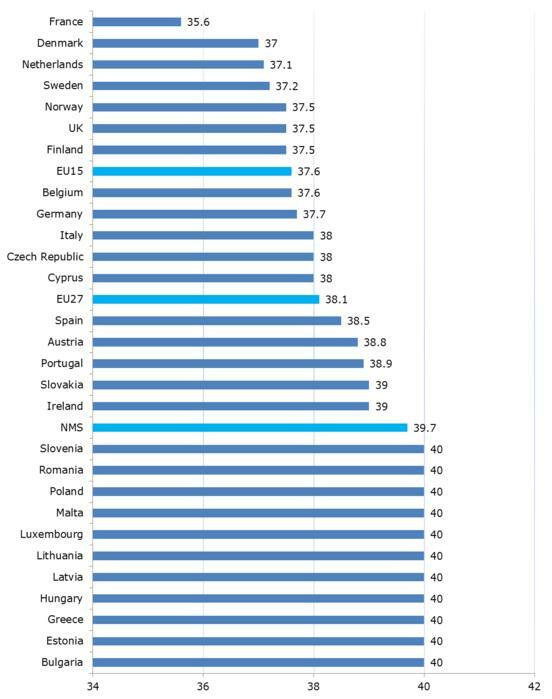 Across the EU27, men worked on average 2.1 hours more than women. The gap is wider in the EU15 than in the NMS. In the EU15, men work 2.3 hours more per week than do women; by contrast, in the NMS, men work around 1.6 hours more than women. Again, these averages conceal more stark national situations: men’s actual weekly hours exceeded women’s by three hours or more in Ireland, Italy and the UK, by less than one hour in Latvia and Lithuania, and by less than 30 minutes in Bulgaria and Romania. Note: the figure should be read in conjunction with the notes in Annex 5. 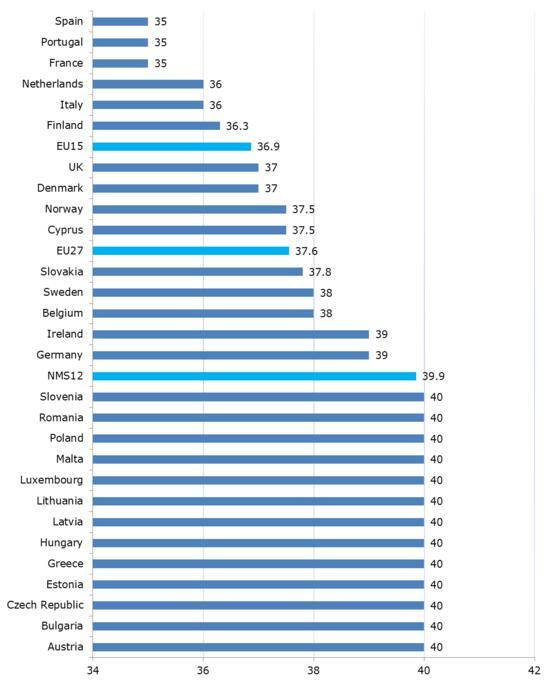 The average annual leave entitlement across the EU27 (for those countries for which data are available) is 26.7 days. For nine of the countries in the EU15, the average is 27.4 days. Agreed annual leave entitlement in the EU15 countries varies as follows: 30 days in Denmark and Germany, 28 days in Italy, 25 days in Finland, Luxembourg and the Netherlands (and Norway), 24.7 days in the UK, 24 in Ireland and 23 in Greece. Among the NMS, figures are available only for the Czech Republic, Estonia, Malta, Romania and Slovenia, where the average collectively agreed paid annual leave is 22.2 days. Among these countries agreed leave is highest in the Czech Republic, with 25 days, and lowest in Estonia and Slovenia with 20 days. All 28 countries studied have a statutory minimum period of paid annual leave, as set out in Figure 10. In the figure, the leave is expressed in days and harmonised on the basis of a five-day working week. The number of days represents only the basic entitlement, since entitlement increases with length of service in some countries. The majority of countries, 18 out of 28, have a 20-day minimum entitlement as laid down in the EU Working Time Directive. This group includes Belgium, Finland, Germany, Greece, Ireland, the Netherlands and the UK, as well as all the NMS except Malta (24 days). Six countries have a 25-day minimum – Austria, Denmark, France, Italy, Luxembourg and Sweden – while the entitlement is 22 days in Portugal and Spain, and 21 in Norway. The UK increased its statutory entitlement from 20 to 28 days over the period 2007–2009. However, this includes eight public holidays, and the increase was designed to end some employers’ practice of counting those days as part of workers’ statutory entitlement. As a result, actual UK statutory annual leave entitlement might perhaps more properly be considered to be 20 days. Note: the figure should be read in conjunction with the notes in Annex 6. Looking at Figures 9 and 10, average collectively agreed annual leave exceeds the statutory minimum by four days or more in the Czech Republic, Denmark, Finland, Germany, Ireland, the Netherlands, Norway and the UK (if statutory entitlement in the UK is taken as 20 days), suggesting that the law acts essentially as a safety net in these countries. Average collectively agreed annual leave and the statutory minimum are the same in Estonia, Luxembourg, Malta and Slovenia. In Greece, Italy and Romania, the agreed annual leave exceeds the statutory minimum by between one and three days. In order to arrive at a crude annual estimate for collectively agreed annual normal working time in all countries for 2011, the figures are taken for the average collectively agreed normal weekly hours (see Figure 1) and a five-day working week throughout the 52 weeks of the year has been assumed. From this total annual figure, the average collectively agreed annual paid leave (see Figure 9) is subtracted or, where no data are available on this point, the minimum statutory annual leave (see Figure 10) is subtracted. 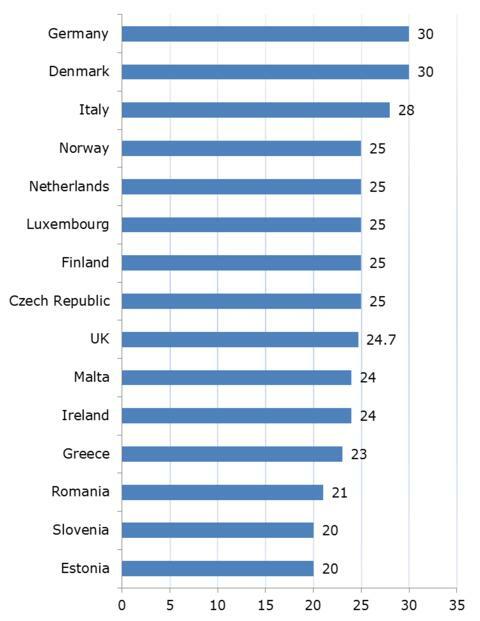 As noted above, in the Czech Republic, Denmark, Finland, Germany, Ireland, the Netherlands, Norway and the UK, the average agreed leave is considerably higher than the statutory minimum (although it may be impossible to calculate owing to the complexity of the rules or a lack of current data). Use of the statutory minimum leave in calculating collectively agreed annual normal working time thus makes the total figure rather higher than it might actually be, rendering the estimates for these countries particularly crude. The resulting annual figures do not, of course, take into account factors such as overtime working, other forms of time off and leave, or short-time working. They are only very rough estimates, but they allow some broad observations to be made (see Table 1). In 2011 in the EU27 average collectively agreed annual normal working time was 1,720.3 hours. In the EU15 it was 1,685.6 hours, and in the NMS 1,830.8 hours. Workers in the NMS thus work, on average, 145.2 hours a year (around 8.6%) longer than their counterparts in the EU15 – the equivalent of over 3.5 working weeks. However, in two NMS (the Czech Republic and Cyprus), annual working time is around the average for the EU27. Overall, the EU’s longest hours are worked in Hungary, Romania, Estonia, Poland, Latvia, Lithuania and Slovenia, while the shortest are worked in France, Denmark, Germany, Italy and Sweden. In 2011, employees in Hungary and Romania had to work 283.4 hours more on average (the equivalent of around 7 weeks of work in Hungary or Romania) than their counterparts in France. Looking at the ranking of the 28 countries in terms of the length of their agreed working hours, the countries with the longest and shortest weekly hours are generally also those with the longest and shortest annual hours. However, the annual perspective results in rather different rankings for some countries than those provided by the figures for weekly hours. Some countries, such as the Czech Republic, Finland, Germany, Italy and Spain, have a relatively lower position in the ‘league table’ for normal annual hours than in the table for normal weekly hours (in other words, their hours are shorter) because of the effects of relatively long annual leave and/or a relatively high number of public holidays. Conversely, hours are longer in other countries, placing these countries higher in the table for normal annual hours than in the table for normal weekly hours because of the effects of a relatively low number of public holidays and/or relatively limited annual leave. Countries in this category include Belgium, the Netherlands, Norway and the UK; in Belgium, however, the annual leave figures used are for minimum statutory leave due to an absence of data on agreed leave. The number of public holidays (excluding those falling on Sundays) varied in 2011 from a minimum of six in Romania and the Netherlands up to 14 days in Spain. The average number of public holidays in the EU27 was 8.9, with the NMS having on average fewer days (8.6 days) than the EU15 (9.2 days). The combined total of agreed annual leave and public holidays varied in the EU from 40 days in Germany to 27 days in Hungary and Romania – a difference of around 48% or 2.5 working weeks. Other notably high-leave countries in 2011 included Italy and Denmark (with 39 leave days in total), while other notably low-leave countries included Estonia with 28 days, Poland with 29 days, and Belgium, Latvia, Lithuania and Slovenia with 30 days. The average figure for the EU27 was 34.2 days – 35.9 days in the EU15 and 29.4 days in the NMS. Austria – Estimation on the basis of the most important collective agreements that in general provide for 38.5 to 39 hours a week. Belgium – The figure is an estimate calculated by the Federal Public Service for Employment, Labour and Social Dialogue. The calculation takes into account (only) the provisions of sectoral collective agreements in the private sector. These agreements cover a very high proportion of the private sector, but not all the employees. For example, the company agreements of state enterprises, such as railways or postal services, are not included. These sector agreements can furthermore be amended by company agreements (such as working time reduction or alternative working time regimes). It is also important to note that managerial staff (kaderleden/cadres) are generally not bound by Belgian working time rules and legislation. The Federal Public Service normally publishes not the exact figure, but an index, separately for blue-collar and white-collar workers. For both categories this index has remained unchanged since the beginning of 2003. Bulgaria – Normal weekly working time is rarely collectively agreed. No data available. Cyprus – Source: Cyprus Labour Institute (INEK-PEO). Czech Republic – 37.3 to 39.6 hours, depending on the working time arrangements: single shift operation (39.6 hours/week), two-shift operation (38.3 hours/week), operation on three shifts (37.4 hours/week), continuous operating (37.3 hours/week). The figure provided is based on company-level collective agreements (CLCAs) containing provisions on the number of working hours per week without differentiation of working mode. Source: Working Conditions Information System (WCIS), a regular annual survey of wages and working conditions negotiated in collective agreements for the relevant year. Denmark – Estimation based on weekly working hours provided by various collective agreements. Estonia – as set by law. Greece – Estimation based on various collective agreements. Ireland – The figure is an estimate based on the Programme for National Recovery (PNR), from 1987, which set a framework agreement on the shortening of the working week by one hour in cases where the normal working week was 40 hours or more; the implementation was to be negotiated locally, on an organisation-by-organisation basis. Italy – The figure represents an estimate based on the range 36–40 hours per week provided in collective agreements. Lithuania – as set by law. Latvia – as set by law. Luxembourg – as set by law. Malta – The figure is an estimate based on the fact that, while no statistical data exist, most collective agreements specify a normal weekly working time of 40 hours. Netherlands – The figure is from the Labour Inspectorate’s review of collective agreements; no changes have been registered since 2007. Norway – The figure represents ‘normal working hours’ for employees covered by collective agreements; employees working shifts or at night work fewer weekly hours. Poland – as set by law. Portugal – Over 90% of the workforce in the private sector are covered by some kind of collective agreement, independently from the year of signature. According to statistics published by the Ministry of Labour, the average collectively agreed working week in 2010 would be 38.9 hours. The source does not state whether the presented data are weighted or not. Source: Ministry of Labour/Office of Strategy and Planning (GEP), Quadros de Pessoal, 2010. Romania – Estimation based on collective agreements and addenda signed in 2011, The Official Gazette. Slovakia – Average figure is based on a sample survey conducted in organisations employing almost 41% of employees in the economy. Source: Information system on Working Conditions (ISPP), 2011, by Trexima Bratislava. Slovenia – as set by law. Spain – Own calculation based on average agreed annual working time of 1,757.3 hours in 2011, on the assumption of a six-day working week and 274 working days per year. Sweden – Statistics Sweden (SCB). UK – Incomes Data Services (IDS) figures based on a database of information from 319 organisations and industry agreements (2011). Austria – Estimate based on various collective agreements. Belgium – Estimate of 38 hours. However, most large chemical companies – often situated near the port of Antwerp – will have a shorter working time arrangement. Examples exist of a 33.5-hour average working week, reserved for shift workers performing weekend work. Bulgaria – There is no collective agreement signed at sectoral level. Collective agreements of individual companies in the industry refer to the provisions of the Labour Code regarding weekly working time. The companies in the sector often calculate individual working time on a monthly basis – 168 hours. Source: CITUB National Labour Federation ‘Chemistry and Industry’ (NLF ‘Chemistry and Industry’). Cyprus – Figures from Cyprus Industrial, Commercial, Press-Printing and General Services Workers’ Trade Union affiliated to the Pancyprian Federation of Labour (PEO). Czech Republic – The figure, from WCIS, is based on company-level collective agreements (CLCAs) prescribing working hours without differentiation of working mode (other collective agreements are not taken into account) that have been concluded by members of the ECHO Trade Union (Odborový svaz ECHO). Denmark – Agreement between Confederation of Danish Industry (DI) and Central Federation of Industrial Employees (Centralorganisationen af Industriansatte, CO-Industri). Estonia – Estimate based on collective agreements register (Ministry of Social Affairs). Finland – The figure corresponds to collectively agreed normal weekly working hours in chemicals in 2011. France – The figure is the average collectively agreed normal weekly working time in the chemical sector since 1999. Germany – Source: Collective Bargaining Archive of the Economic and Social Research Institute (WSI); the national average breaks down to 37.5 hours in western Germany and 40 in eastern Germany. Greece – Source: Mediation and Arbitration Service (OMED). Hungary – Source: Federation of Trade Unions of the Chemical, Energy and Allied Workers (VDSZ). Ireland – The figure is an estimate based on the Programme for National Recovery (PNR), from 1987. Italy – Source: National Archive of Collective Agreements (Archivio Nazionale dei Contratti collettivi di lavoro) of the Cnel (Consiglio Nazionale dell’Economia e del Lavoro, National Council for Economic Affairs and Labour). Luxembourg – The figure is an estimate from the Luxembourg Confederation of Independent Trade Unions (OGB-L). Malta – Source: Chemicals and Energy Section of the General Workers’ Union (GWU). Netherlands – The figure is an estimate calculated from a sample of company agreements. Portugal – The figure relates to collective agreements signed by the Portuguese Association of Chemicals Companies (Associação Portuguesa das Empresas Químicas, APEQ) and the Federation of Service Workers’ and Technicians’ Unions (Federação dos Sindicatos dos Trabalhadores de Serviços, FETESE). Please note that there was no agreement in 2010 and 2011. Slovakia – Source: multi-employer collective agreement concluded by Energy-Chemical Trade Union Association (ECHOZ) for the chemical industry for 2009–2011. Spain – Figure calculated from the Ministry of Labour and Social Security collective bargaining provisional statistics on average agreed annual working hours for the sector in 2011 – 1,747.1 hours – on the assumption of a six-day week and 274 working days a year. Sweden – Source: collective agreement for the sector, Kollektivavtal 2010–2012 KEMISKA. UK – The figure from IDS is the average which refers to ‘oil, chemicals and pharmaceuticals’. Belgium – The figure is a weighted average of weekly working hours, taking into account the distribution of workers employed in the different subsectors. Bulgaria – The figure corresponds to the provision of the Labour Code for a 40-hour working week. Cyprus – Source: Cyprus Industrial, Commercial, Press-Printing and General Services Workers’ Trade Union affiliated to the Pancyprian Federation of Labour (PEO). Czech Republic – The figure, from the WCIS, refers to hours set by company-level collective agreements (CLCAs) concluded with the Trade Union of Workers in Commerce (Odborový svaz pracovníků obchodu, OSPO). Members of this union are organisations operating in the sector of commerce generally (that is, not only in the retail sector). Finland – The figure corresponds to collectively agreed normal weekly working hours in the retail sector in 2011. France – The figure is an estimate based on collective agreements of some retail subsectors such as: ‘jewellery and watch making’, ‘fruits, vegetables, grocery and dairy products’ and ‘non-alimentary products’. Germany – Source: Collective Bargaining Archive of the Economic and Social Research Institute (WSI); the national average breaks down to 37 hours in western Germany and 38 in eastern Germany. Greece – Source: National Confederation of Greek Commerce (ESEE). Hungary – Source: Trade Union of Commerce Workers (KASZ). Luxembourg – The figure is from OGB-L.
Malta – Source: Hospitality and Food Section of the General Workers’ Union (GWU). Netherlands – The figure is an estimate based on a sample of agreements and data from the Labour Inspectorate: Voorjaarsrapportage 2011. Portugal – Source: Branch agreement between the Association of Distribution Companies (APED) and the Federation of Commerce, Office and Service Unions (Federação Portuguesa dos Sindicatos do Comércio, Escritórios e Serviços, FEPCES), affiliated to the General Confederation of Portuguese Workers (CGTP-IN). Romania – Estimate based on collective agreements at company level. Slovakia – Estimate based on multi-employer collective agreements concluded for retail and tourism sectors (data on retail only are not available). Source: Information system on Working Conditions (ISPP), 2011, by Trexima Bratislava. Spain – Figure calculated on the basis of 1,785 working hours as the annual average, on the assumption of a six-day week and 274 working days per year; source: Ministry of Labour and Social Security. UK – Figure from Incomes Data Services, IDS, refers to ‘retail’. Austria – Working time established by public sector employment law. Belgium – The figure corresponds to the general, statutory rule in the public sector. Bulgaria – as set by law. Cyprus – Source: Pancyprian Public Employees Trade Union (PASYDY). Czech Republic – Hours set by labour law; the exception is 30 hours per week for workers under 18 years. Denmark – Source: collective agreement between the Ministry of Finance and the Danish Central Federation of State Employees’ Organisations (CFU). France – Estimate on the basis of collective agreements in the civil service sector. Germany – The figure is from the Collective Agreement Archive of the WSI and applies to western Germany; the figure for eastern Germany was 40 hours. Malta – Source: Government and Public Entities Section, General Workers’ Union (GWU). Portugal – Figure defined by law for public administration as a whole. Romania – as set by law. Slovakia – Figure based on multi-employer collective agreements concluded for the civil service. Spain – as set by law. UK – The figure, from Incomes Data Services (IDS), refers to ‘public services’. The data in Figure 9 should be read in conjunction with the following notes. Czech Republic – Extension of leave by a certain number of days or weeks is negotiated in collective agreements; according to the WCIS, in 2011, more than 78% of company-level collective agreements included an extension of the leave entitlement by one week – making it five weeks in total. Cyprus – Data from the Ministry of Labour and Social Insurance. Denmark – Composed of 25 days according to the Holiday Act and five special holidays, according to the agreement, that can be placed individually. Estonia – As there is no exact information on the number of collective agreements including any changes in annual paid leave, it is not possible to provide a reliable estimate of average collectively agreed annual paid leave. Collective agreements only cover a small part of the total workforce in Estonia, therefore the annual paid leave provided is based on the legislation. France – Expressed as 30 working days, including Saturdays; can be extended in case of more favourable collective agreement, and for workers below 21 and under specific conditions. Finland – Estimate from different collective agreements. Germany – Data from the Collective Agreement Archive of the WSI. Greece – Estimate of the EIRO correspondent; there is a range of entitlements, which vary from 20 to 26 days, depending on years of service. Italy – Calculated as four weeks plus reductions in annual working hours through collective bargaining. Netherlands – The figure is an estimate; it depends on career length and workers’ age. Some agreements mention 24 or 25 days, others even mention hours. Romania – Estimate on basis of collective agreements and addenda signed in 2011, The Official Gazette. This increases with length of service up to a maximum of 30 days. Slovakia – The figure is an estimate, based on the fact that (according to the WCIS), on average, five days more than the statutory minimum were agreed in 23.4% of surveyed companies for 2011. UK – This figure is from the IDS, which refers to basic annual leave entitlement after one year’s service. The data in Figure 10 should be read in conjunction with the following notes. Austria – Expressed as 30 working days, including Saturdays. Belgium – The figure refers to the private sector; minimum statutory entitlement in the public sector is 24 days. Cyprus – 25 days for those working a six-day week. Italy – Expressed as four weeks plus five compensation days. Poland – Entitlement increases from 20 to 26 days after 10 years of employment. Slovenia – Expressed as four weeks; older workers, workers with disabilities and those taking care of children with disabilities are entitled to at least three additional days, and workers under the age of 18 are entitled to seven additional working days; leave entitlement increases for parents by one day a year for each child under the age of 15. UK – Since April 2009, the statutory entitlement has included eight public holidays.